Conceptualize and write a presentation to be given at the regional meeting of the Society for Radiation Oncology Administrators that dynamically communicated the unprecedented response to Hurricanes Katrina and Rita provided by the area’s premier cancer treatment facility. Explain how physicians and administrators were able to accommodate every patient who sought cancer treatment in spite of daunting challenges such as destroyed medical records, compromised communications and uncertain resources. 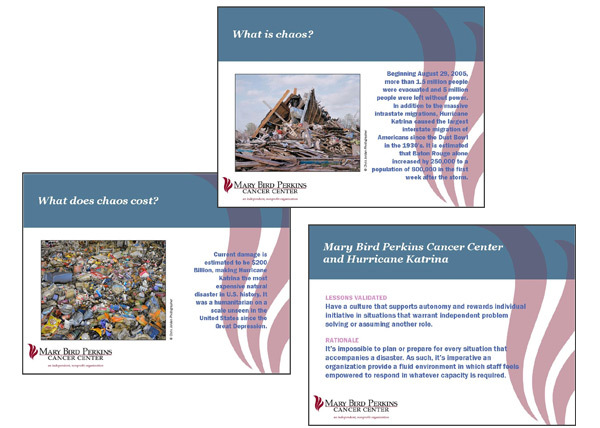 Mary Bird Perkins Cancer Center is the only community-owned, independent, nonprofit cancer treatment, education and research facility in the state. With locations in Baton Rouge, Covington and Hammond, Louisiana, the mission of Mary Bird Perkins is to provide high-quality treatment technology and compassionate support services to all patients and their families. Review all internal communications related to the crisis response. Research Mary Bird Perkins disaster plan in relation to other radiation oncology facilities. Meet with and interview senior staff for personal testimonies regarding their recollections and individual roles. Research and gather Katrina-related statistics specific to the health care impact. Write presentation; provide supporting data and images.